Brand new... Buy, move in! Includes transfer duty of R200 000." Well designed, three bedroom, spacious home with a neat garden in a wonderfully peaceful area.... There is ample bird-life, listen to the loeries in the mornings and watch the sunbirds visit the garden, small antelope roam nearby. A stone's throw from the Knysna lagoon, it takes a mere 2 minutes to walk to the jetty and the waters edge. Where you can go fishing, kayaking, swimming or just enjoy the tranquility. Brenton beach is just over the hill. Driving home from town which is 15 minutes away is an absolute pleasure with views of the ocean and lagoon all the way. The security of this home is what sets it apart from the other homes at The Woods. No transfer duty, no homeowners association or fees and no levy. The 311 square metre home consists of 3 large bedrooms main en suite, the other 2 bedrooms are also en-suite 'jack n jill' style. The lounge, dining and kitchen area (large separate scullery) are spacious and open plan with an open double volume ceiling. The main bedroom also boasts a double volume ceiling. The T.V. room is generous and has a study area too. 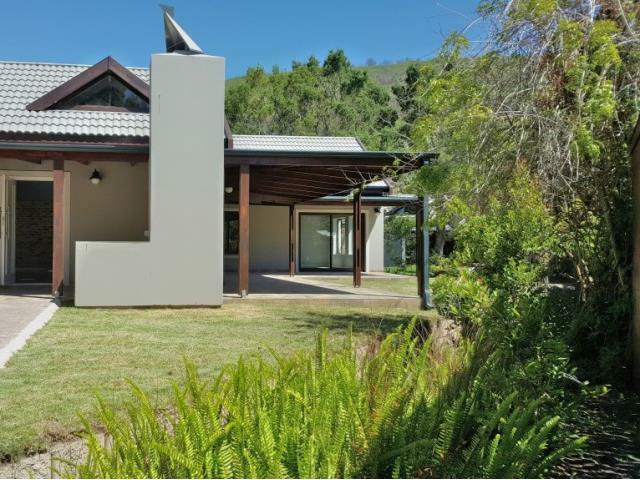 Large wrap around verandah with a built in braai is ideal for outdoor living. Double garage and a paved area for a third vehicle, a boat, trailer or caravan. There is also a guest toilet. The buyer can choose the carpets/ laminate flooring/ tiles for the bedrooms. Brand new... Buy, move in! Includes transfer duty of R200 000.